This slow cooker refried bean recipe is simple but adding butternut squash amps up the nutrition. The chipotle brings a little spicy and lots of smokiness. The cilantro and lime give it a fresh flavor that you’ll love it in your favorite tacos, burritos and more! Please note that this recipe uses a 1½ to 2 quart slow cooker. 1 cup dried beans anasazi, pinto, or other "brown bean". Combine the dried beans and water in the slow cooker and cook on low overnight. Add the butternut squash, garlic, tomatoes, marjoram, and chili powder. Taste and adjust seasonings. Add salt, hot pepper, and lime juice. 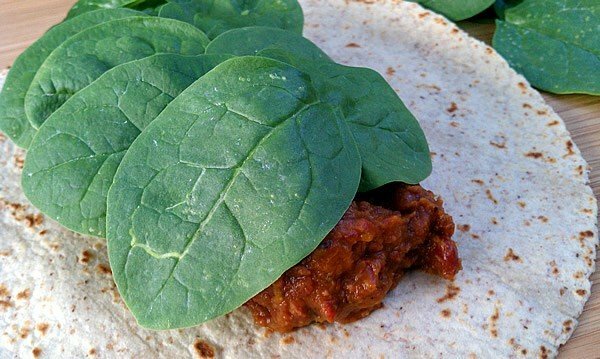 You can also make a quick mexi-pizza if you spread the frijoles on a tortilla thinly and top with some vegan chorizo and a little Daiya vegan cheese. Plus it cooks in minutes! You probably have some Winter squash on your t-day menu. If you make an extra cup and purée it, you are ready to make these beans. If you don’t have time to make the beans now, go ahead and freeze the extra squash in 1 cup portions so it will be ready to go when you want to make them. You can use pumpkin, acorn, or kuri in place of the butternut. But think about doing something different and use butternut where you usually use pumpkin or sweet potato. After all, Winter squash need some love around the holidays too. I love to use left over veggies just putting them over brown rice, in a stir fry or by making a soup. I love using them up in a stir-fry with some tofu and brown rice! I like to use them in a casserole with a grain. Love to use my leftover peppers and onions to saute and put over a plate of hummus and munch it with fresh pita wedges! I love to use leftover veggies in tacos with beans and vegan sour cream! My favorite way to use leftover veggies is to mix with rice and use either Chinese,Mexican or Italian seasoning. All depends on my mood to which way i season! I use up my leftover veggies by making soup! and if I have leftover rice I throw that in too! I signed up at Key Ingredient and requested to be a friend (averydog); thanks. Sometimes I make polenta for breakfast, and top it with leftover veggies from the night before. My favorite way of using left over veggies is in a soup….I add vegetable boullion (made from the water of cooked veggies-I freeze the left over water in ice cube trays and bag the cubes for use later). I love to use them up in a wrap with hummus and rice. Yum! I like to throw leftover veggies in chili. Almost any veggie combination tastes good with a little chili powder! Leftover veggies are fab in soups, salads, and on pizzas. Soup is the best way for us to use most leftovers. I usually make a soup, though I tried croquettes last week and may have to do that again sometime! Did I just hear the words “quick mexi pizza”??? I think that just might be my newest favorite way to eat leftover veggies! Now that I think about it, I usually eat every last veggie on my plate/on the table that I never have leftovers. Hrmpf. 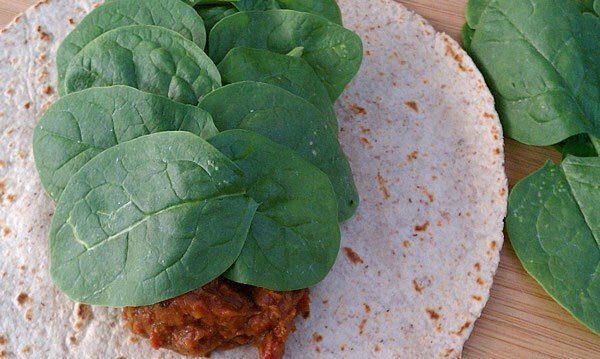 I use my leftover veggies to make wraps. I like to heat them up and mix it with some couscous and edamame for a quick and filling dinner. Signed up on key ingredient and sent you a friend request. I use left over veggies in soups and I save left over bits for veggie stock. I make it in the slow cooker and then freeze it in batches. I put dabs of leftovers into a bowl in my freezer. Then, when it’s full, I have goodies for soup. I just add veg broth and a few seasonings and I have yummy soup for dinner. Those look great – I am always looking for new squash recipes! As for leftover veggies, chalk up another vote for stir fry! Tofu scramble! I only make them to use up odds and ends. I chop them up and make a “Kitchen Sink” veggie bowl with marinara, hummus and balsamic vinegar. So simple, yet so good! W/ homemade hummus (from Candle Cafes cookbook)…everything tastes great slathered in it!